Consists of several interdependent systems that are designed to act in unison to deter, detect, deny access to unauthorized individuals. A dynamic field in modern society involving the protection and prevention of damage or theft of vital information contained within computer systems. Focuses on alarm and fire containment systems, close circuit television, electronic access control, intrusion detection systems, and biometric technologies. Audemus' commitment to our nation's veterans is no more evident than in our 100% veteran guard corps. Our personnel have extensive experience in both the public and private sector, as well as attending a rigorous and ongoing professional development pipeline. From entry level Guards to Loss Prevention Officers (LPO) to Personal Protective Officers (PPO), our careers are designed to promote espirt de corps, reward initiative, and encourage the highest professionalism. Once Audemus locates loss for a client, we immediately develop a plan to mitigate it. A uniformed unarmed patrol presence frequently will be enough of a deterrent to potential criminal, but for persistent issues undercover LPOs can be utilized to prevent, document, and liaison with law enforcement. Our protective services personnel represent the best Audemus has to offer. PPOs are trained in all facets of operational risk management and have excelled during their careers. From individuals in crisis to companies proactively mitigating violence or crime, Audemus has armed Personal Protective Officers. 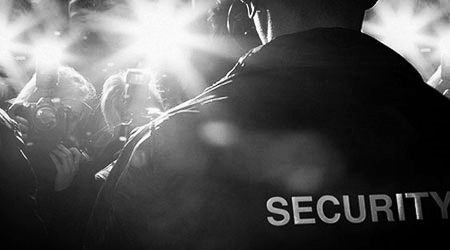 We provide executive protection domestically and internationally. We also provide protective services at a significantly reduced rate to families experiencing domestic violence. Extracting data from computers, tablets, and smart phones requires the use of specialized technology in conjunction with a forensic investigator with expertise and experience. Audemus provides not just the technical know how, but also the analytical support to interpret the data and the legal support of an attorney with in depth knowledge of E-Discovery. During the Cold War, bugs were physical listening devices that were cheap to produce and deploy. Today, modern bugs vary in design and capability; from the much smaller audio and video devices to malicious software (MALWARE) packages that can infect everything from your smartphone to your tablet to your computer. The capabilities of different MALWARE packages vary, but some of the common capabilities are: providing your GPS location in real time, your SMS history, and eavesdropping on calls. Why hire multiple experts when you can let Audemus provide you with full digital and physical debugging? The past decade has been one major date breach after another; governments, corporations, celebrities. No one has been immune and what used to be rare has become disturbingly familiar on the 24 hour news cycle. These data breaches largely go unprosecuted by law enforcement as "black hat" hackers are able to stay a step ahead of law enforcement both technologically and geographically (most "black hat" hackers are foreign). While large corporations can recover from such data losses, to small and medium sized companies these losses can be catastrophic. Protect your business and livelihood with the professionals at Audemus. Audemus has partnered ESS, a service, installation, and maintenance company with a proven track record over the past two decades. ESS has extensive experience with state of the art equipment regarding, but not limited to the following; access control, close circuit television, intrusion detection technologies, fire alarm and control systems. In today's integrated security world leveraging our two decades of experience in conjunction with up-to-date software and hardware can yield amazing results at a minimal cost. ESS can provide a complete solution from design consultation to installation and maintenance service for any type of commercial or residential need. Digital security systems are a critical part of maintaining a secure environment, now more than ever. ESS can easily install any type of networked access control system including biometric devices, giving you access to unparalleled knowledge of how employees and guests move through all controlled environments with access provided securely through an encrypted networked connection. Control your entire world at the touch of a button - locking and unlocking doors, create reports on the fly, and accessing video streams from anywhere in the world. From one camera to thousands, ESS has the high resolution, scalable solution that provides turn-key integration to clients. Our camera systems can do more than just record super high definition video or high video frame rates. Using the most cutting edge analytics; instantly capture and log anything from the license plate of the car that got away to the face of a hostile threat entering a secure facility. The data then gathered from the system does not just get filed away for storage, it actually goes to work for you. The system instantly notifies you of an event via SMS or email, giving you the ability to physically lock down the facility, review footage remotely, or notify the authorities - all through a single, simple, easy to use interface.